At 640 m high, Digital Media City Landmark tower in Seoul, South Korea will be around 180m shorter than the Burj Dubai, but it is projected to be the second tallest building in the world when it completes in April 2015. Having broken ground this week, the Samoo-designed tower costing 3.3 trillion won ($2.8billion), will now rise 133 floors in height. 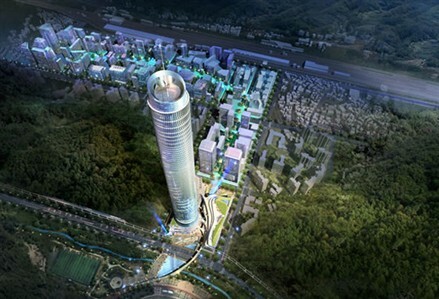 "Differently from skyscrapers in other countries, this is a town within a building that has urban facilities under one roof," said Kim Wu-Seok, president of Seoul Lilte Tower Asset Management, a consortium constructing the building. It will house not only luxury hotels and business offices but an observatory, broadcasting companies, restaurants, apartments, department stores, medical clinics, a multiplex cinema and an aquarium. "From the sky lounge on the highest floor, you will be able to take a glimpse of Kaesong," a North Korean city near the border, he told Yonhap news agency. The building is modelled on communications facilities on Korean mountaintops in past centuries, which used fire and smoke signals to relay urgent messages between the capital and the countryside. The Koreans are trying to convert the 1500 acres of reclaimed land to a major business hub for Northeast Asia and the construction of such a huge building is said to be an effort to attain the dream of the Koreans. The project called Digital Media City twill be completed in phases and the total cost is estimated to be worth $11 billion. The Mayor of Seoul Oh Se-hoon regards the development as a place where the possibilities are 'limitless': "We believe that Digital Media City will generate the ideas via which the full potential of digital media's application to every aspect of business, personal and community life wil be realized: a crucible of innovation." Digital Media City's technological spine is Digital Media Street, a 1.14 km street where interactive information booths, intelligent lighting and facades will guide you through the "city".